This 5lb box of our award-winning boudin is made with the perfect combination of pork, rice, onion tops, and seasonings. We've spent several decades refining our pork boudin recipe, and we believe you'll enjoy it. GREAT boudin at a great price. Love it !! Grew up on boudin,best sausage in the world period. Living in conneticut now. Nothing here even compares. Excellent flavor. Spicy but reasonable. Arrived on time and in good shape. 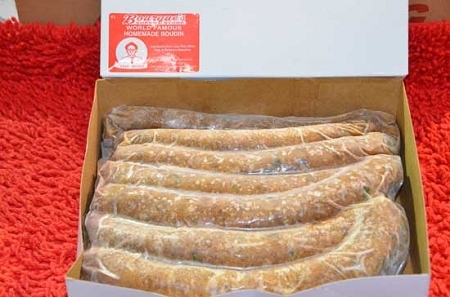 My only complaint is that the five pounds of boudin was sealed in one large vacuum packed bag. I would have preferred to have it in five one pound bags to make it easier to freeze in portions. Next time I'll ask for that. I ordered these for a friend who worked in Louisiana where he developed a taste for boudin. He said these were spicier than the ones he got in Baton Rouge but he enjoyed them all the same. Love this Boudin!!! I went to college in Louisiana and fell in love with the food but living in Arkansas it is hard to get true boudin this far north so glad to have a place that offers quality food, great prices, easy ordering, and fast shipping. Little Rock Thanks You!! !